Each Memorial weekend we head out to Hood Canal with a gang of our friends for three days filled with fresh oysters plucked from the beach, a communal seafood paella, s'mores at night, and all around loads of fun and adventure. It's a weekend where there's no Internet, no cell phones, and the older kids teach the younger ones how to build and tend a campfire. Even when it rains it's fun as we're all outside breathing in the fresh Puget Sound air. Life simply does not get any better. 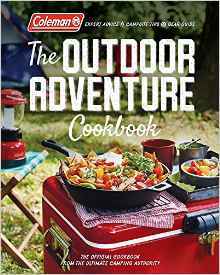 If you love to camp, even in your own backyard, you need The Outdoor Adventure Cookbook, the official cookbook from the ultimate camping authority, Coleman (as in Coleman coolers). This book is beyond a cookbook! It offers expert advice, camping tips, and even includes a gear guide for those heading into the wilderness. 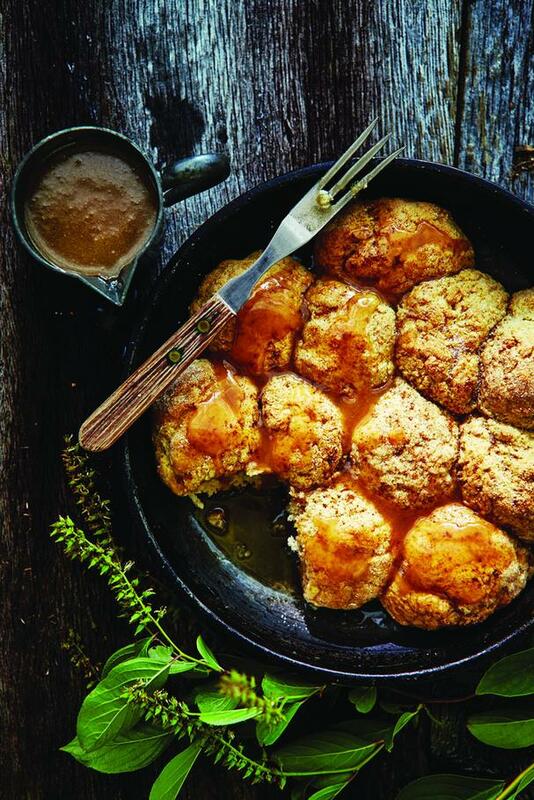 Peppered throughout the book (pun intended) are clever and super useful sidebar tips and tricks, like "Getting Geared Up: With a Dutch oven and a roll of aluminum foil, you can make baked desserts you might not think doable on a camping trip. A 7 1/2-quart cast-iron Dutch oven with a snug-fitting lid (like this one from Coleman) is the most versatile," and is perfect for the S'Mores Cookie Cake (recipe below). One "Think Like a Scout" sidebar tip includes the following advice to capture wasps and other stinging pests: "If you bring a 2-liter plastic bottle of lemon-lime soda, the last of it can come in handy if wasps or yellow jackets are around. Cut off the top thrid of the bottle. Put an inch or so of soda (to attract the bugs) and a couple drops of dish soap (to trap them) into the bottom. Place the top part upside down into the bottom part and set your contraption a little bit away from your picnic table." Brilliant! The book starts with the Coleman story and useful sections on how to pack for camping, how to pack a cooler, how to plan for meals, how to set up camp, how to tend the fire, how to build a good cooking fire, tips for cleaning up, packing up, and how to get the kids involved in the whole shebang. 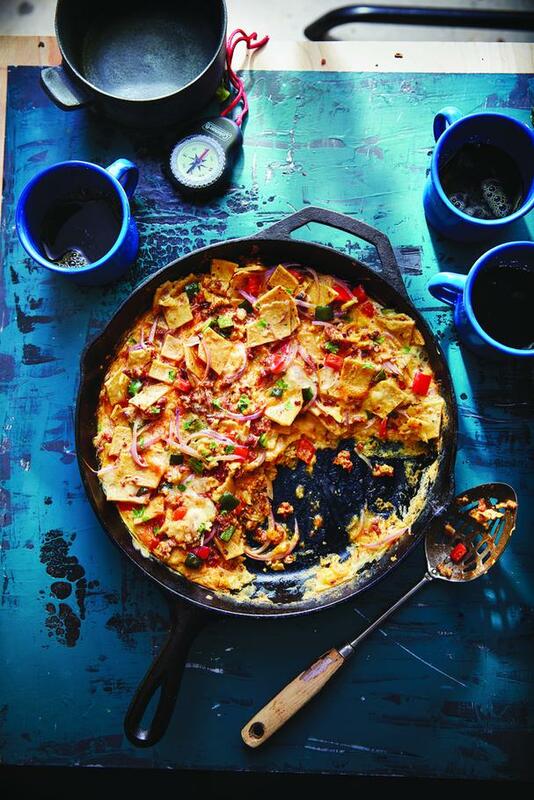 The food ranges from glamp-worthy (aka gourmet camping) dishes like Cast-Iron Skillet Gnocchi with Pesto and Bourbon-Honey Baby Back Ribs, to kid-friendly meals like Easy Cheesy Corn Chip Chili that's served out of individual Fritos bags. Now what kid wouldn't love that?! There are beautiful breakfasts like the Lemon-Blackberry-Ricotta Waffles with Whipped Cream. Waffles while camping, you ask? Yup, Coleman's got a simple no-plug waffle iron that can be placed on a camping stove or over held over hot coals. There are scrumptious kid-friendly and adult drinks like the non-alcoholic Blueberry-Citrus Mule (made with non-alcoholic ginger beer) and an adults-only Bloody Barry (made with beer in lieu of vodka). Snacks include make-at-home Maple-Bacon-Pecan Popcorn Balls and Sweet-Savory Granola Bars (a bit of Worchestershire sauce is the secret salty ingredient). 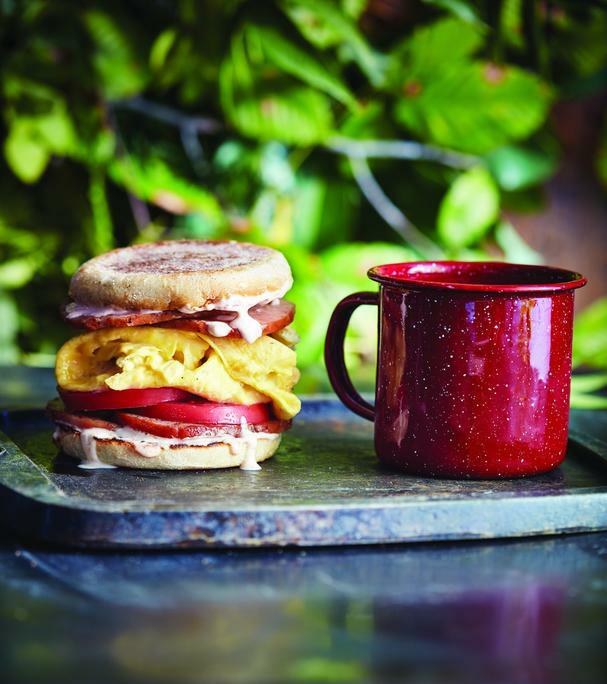 "Serve this hearty breakfast sandwich before a day of hiking. The lemony mayonnaise complements the smoky bacon, elevating this sandwich to the highest peak." 1. Heat a camping stove to medium-high (about 375° to 400°F), or fit a grilling grate over the direct heat of glowing embers. Preheat a 10-inch cast-iron skillet on the camping stove or grilling grate 5 minutes. Place the muffin halves, buttered side down, in the skillet, and cook until lightly toasted, 3 to 4 minutes. Remove the muffins from the skillet, and set aside. Melt 1 tablespoon of the butter in the skillet; add the bacon slices, and cook until lightly browned, about 2 minutes per side. Remove the bacon slices from skillet, and set aside. Wipe the skillet clean. 2. Whisk together the eggs, salt, and pepper in a medium bowl until combined. Melt the remaining 2 tablespoons butter in the skillet; add the eggs, and cook, without stirring, until the eggs start to set on bottom. Continue cooking, stirring occasionally, until desired degree of doneness. 3. Stir together the mayonnaise, lemon juice, and smoked paprika. Place one bacon slice on the toasted side of each of four muffin halves; top evenly with cooked eggs. Top each with one tomato slice, another bacon slice, and a dollop of lemon mayonnaise. Cover with the remaining muffin halves, and serve immediately. To save space in your cooler, you can crack and gently mix the eggs at home, and then use a funnel to pour them into a water bottle or other leakproof container. They’ll store safely for a couple of days once out of their shells. When you’re ready to cook, just give them a gentle shake and pour them into the skillet. If you prefer to bring whole eggs, use a Coleman® egg container to safely store them in your cooler. It’s also handy for transporting hard-boiled eggs. 2. Meanwhile, grease a 9-inch round cake pan with 1 tablespoon of the melted butter. Stir together the baking mix, egg, 2 tablespoons of the granulated sugar, and 11⁄2 teaspoons of the cinnamon in a bowl. Add 2 tablespoons of the melted butter and 6 tablespoons of the milk; stir until a soft dough forms. Combine the remaining 3 tablespoons granulated sugar and 1⁄2 teaspoon cinnamon on a plate. Shape the dough into balls, using about 1 heaping tablespoon of dough for each. Roll in the sugar mixture on plate, coating all sides. Place the coated dough balls in the prepared cake pan. 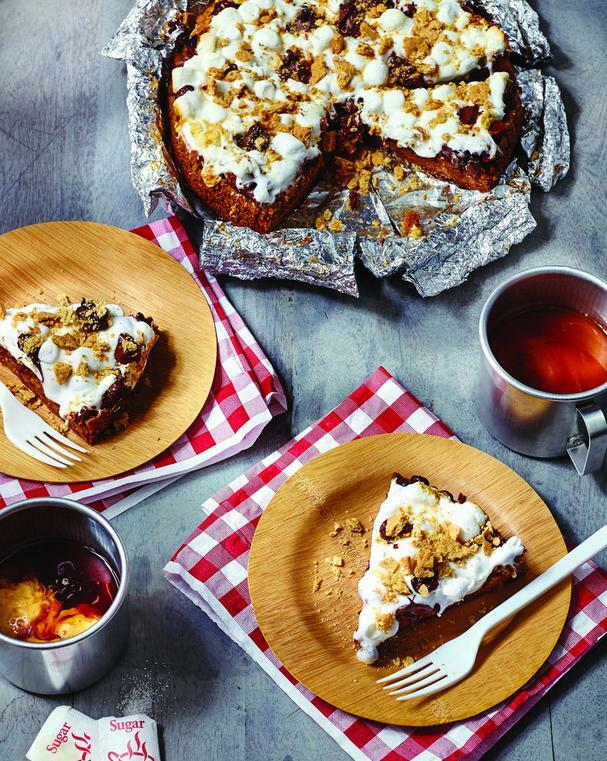 "This giant cookie is a sweet, indulgent treat that tastes like a traditional campfire s’more. The cookie base is soft and gooey when warm, but firms up after cooling. Bonus: Little kids will be spared a scorched marshmallow or burned fingers." 1. Heat a camping stove to medium (about 350° to 375°F), or fit a grilling grate over the direct heat of glowing embers. Tear or cut 8 (12-inch) squares of aluminum foil. Crumple each foil square into a 2-inch ball. Flatten each slightly, and arrange on bottom of a 71⁄2-quart cast-iron Dutch oven. Cover with the lid, and preheat on the camping stove or grilling grate directly over the heat source 10 minutes. Reduce the heat to medium-low (about 300° to 325°F). 2. Line the bottom and sides of a 9- x 2-inch round cake pan with 2 layers of aluminum foil, allowing the foil to extend about 1 inch above the rim of the cake pan. Fold the edges of the foil down to create an even 1⁄2-inch collar above the rim of the pan. Coat the foil with cooking spray. 3. Finely crush 4 graham crackers in a ziplock plastic freezer bag. Stir together the crushed graham crackers, cookie mix, butter, and egg until a soft dough forms. Press the dough into the prepared cake pan. Using tongs, lower the pan onto the foil balls in the Dutch oven. Cover and cook on the camping stove over medium-low until a knife inserted in the center comes out clean and the edges are golden, about 1 hour. Remove the Dutch oven from the heat. 4. Sprinkle the chocolate chips evenly over the top of the cookie in the Dutch oven; top evenly with the marshmallows. Cover with the lid, and let stand 10 minutes or until the chocolate melts and the marshmallows slightly soften. Coarsely crush the remaining 2 graham crackers, and sprinkle over the marshmallows. Lift the cookie out of cake pan using the foil collar as handles; cut into 10 wedges.